Audi is sponsoring the Emmys again, and launching an ad alongside the awards show that features a family living in the middle of the desert simply to have an excuse to drive their R8s as much, and as fast, as possible. Which is crazy. Even crazier, you can live in the exact house from the ad for a few days as part of an airbnb promotion. The stay includes chauffeured transportation from Las Vegas McCarran airport, all meals prepared by a personal chef, and an R8 V10 Plus in the driveway available for driving. Did we mention it's a real house and not just an advertising prop? It is. 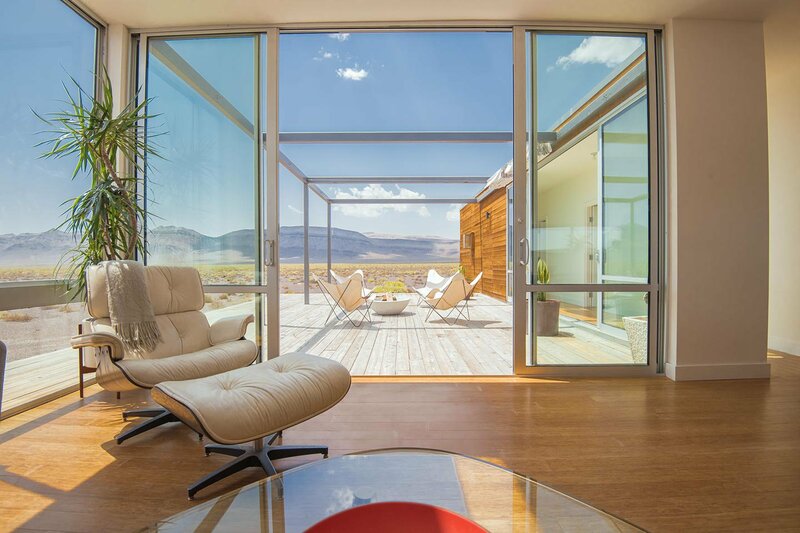 The 1,200 square foot Rondolino Residence sits on 80 acres near Scotty's Junction, Nevada, just over 2 hours northwest of Las Vegas. Beginning September 18, seven three-night stays in October will become available - one booking opens up each day at 9 PM Eastern. The rate is listed at $610 per night, with the bookings running October 10th through November 1st. You can book the experience, or try, on the airbnb page. As for the ad, titled "Desolation," at first it seems like a entertaining jaunt about the lengths people will go to for an amazing driving experience. A deeper (and totally unreasonable - it's just an ad) analysis suggests some truly troubling things going on. For starters, the lackadaisical parents let the children taunt a poisonous scorpion. Will the isolated upbringing and history of cruelty towards animals produce a future serial killer? In our deranged version of this fictional universe, yes. Second, the R8 - spoiler alert, both R8s - get super dirty on the run to the corner store. A corner store, which, seemingly unequipped for coffee roasting nevertheless has fresh artisanal beans sold in half-pound bags. Lacking a bulk purchase option, the plot of the ad surely repeats itself several times a week. That sounds insane, but hey, it's all about the drive. And we do love the "Leadfoot Coffee" easter egg. But we digress. Where is the car wash that left the R8 clean before the drive through the desert? And where is the second R8 parked? The male protagonist clearly drives out of the garage from a position that doesn't leave room for the second car. We can only surmise that there is a underground component to the house in the ad. To be clear, we're still in fictional universe of this ad - the real Rondolino Residence, like the Alamo, lacks a basement. (Update: a reader pointed out that real house doesn't even have a garage, which is also weird.) Anyway, there has to be a car elevator, running water (from an unknown source) and possibly an army of goons hired to maintain a fleet of Audi supercars. We're not sure what depths of madness are required to create such a scenario. Then again, an open desert and a 205-mph supercar are pretty appealing, so we've already rationalized most of this in our head. Except for the kids. Those scamps probably need a nanny.